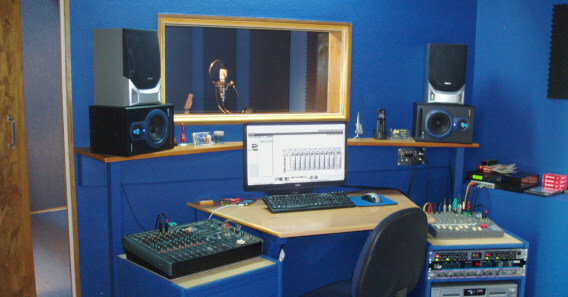 Small and friendly family-run studio, for professional results. Recording time 2.5hrs max. Mixing/mastering time 1.5hrs max. Backing tracks subject to availablity. Gaynor has never sung professionally but told us I've always wanted to make a CD - don't ask why, it's the same as someone who wants to climb Mount Everest! I get nervous singing in public, so making the album was enjoyable and needed to be done before I got too old and the voice went! Rapper-songwriter David Fasanmade, AKA Gee-wiz, was listed as one of the artists to 'watch out for' in The Lyric Only in 2007, and his song Urgent Inquiry made it to the top four finalists in April 2009. His songs display lyrics that he says anyone could relate to, whilst cutting across diverse genres and subjects. Gee-wiz recorded his latest song 'Groove Witcha' in our studio, with backing vocals by Natalia Psalta. The sky is nothing but a stepping stone he said, when we asked him where he pictured this new song going. Abzorba is a Paphos-based trio formed in late 2004. Its music genres range from folk, particularly Irish, to country. The lads came in to cut a demo disc of five songs and did the session in a single afternoon session. Their full-bodied sound comes from acoustic-electric guitar, 5-string electric bass, whistle and accordion, along with vocal lead and harmonies. True to their folk roots there were no over-dubs. The musicians drew on their combined years of experience to get it down first take. George moved from his home land Georgia to Cyprus in 2005 and gathered much praise for his stunning voice. He came in to record several demo tracks and subsequently recorded more material to create a full-length album. Although he favours swing and sings in English the track that's garnered the most interest is Moi Put - a powerful version of My Way sung in his native tongue. George was a finalist in his home country's version of X Factor and has now moved to the UK - watch out, Britain! Prior to recording with Groovejet, I lived in the UK, and performed in my hometown of Kidderminster. I hosted events and open mic nights, but rarely performed myself. After moving to Paphos, I now perform for any and every occasion, and hope to become a successful musician on this beautiful island. Rocky is the third of Suzanne's delightful books for children and the story revolves around the friendship between a huge diplodocus called Rocky and a tiny pterosaur named Ping. We started working with Suzanne on her previous tale Panic in the Clinic, for which we produced the audio CD that accompanies the book. Using music specially written by composer Adam Benobaid and the author's own enthralling story-telling voice, we've also produced an animated DVD that Suzanne uses in schools. This is the second album from Len (guitar/vocals) and Barbara (keyboard/vocals) featuring self-penned christian worship songs. Like the previous disc So Close, sales will raise funds for Ezra International, a cause close to their hearts. We contributed, as before, by adding a few extra instruments whenever the duo required it. Steve's musical inspiration comes from Frank Sinatra, Dean Martin, Tony Bennett and the Ratpack/Vegas era. A time of glamour, when all the men wore suits & all the ladies wore dresses. If you've seen the film Goodfellas, then you know what he means. Steve performs his tribute to the Ratpack at venues throughout Cyprus and recorded a few tracks with us for a demo CD, which he is also looking to expand into an album soon. For singer Jezebel, the temptation of a recording studio on her doorstep couldn't be resisted forever (well, four years actually), and here's the result. The disc is a mixed collection of tracks designed to demonstrate the different genres Jezebel covers. It also gave her the the opportunity to sing in Greek, sing with her great friend George, present a rare duet with her UK-based but equally talented brother Aidan, and a chance for Paul to get the other side of the magic window for a change.